11 Leonis Minoris â€“ Binary consisting of a yellow dwarf (G8) and a red dwarf (M5) in a highly eccentric orbit located 36 light-years from Earth. The G8 A star is a mild flare hazard; check with astrometeorology sources for any current Notice to Astronauts. 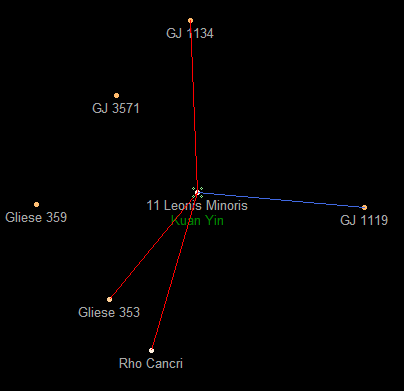 The A component, "Leo" has three planets, all rocky, in near-circular orbits; the M5 B companion, known as the "Cub," has a single Jovian planet. The yellow dwarf's third planet, Sequoia to American officialdom and Kuan Yin to everyone else, is habitable by humans. The low number of planets is attributed to the eccentricity of the stars' orbit around one another; their closest approach prevents stable orbits exceeding 1.3 AU around either star. China opened the system's first KH event in orbit around Kuan Yin's inner moon in 2123, precipitating Kuan Yin's colonization by that country. China ignored claims by the United States, which had first identified the planet as potentially habitable as early as 2099. However, the United States was unable to reach the system via wormhole until 2127, when the second KH event opened, in the leading Trojan point of the systemâ€™s uninhabitable second planet, Amitabha. A significant dispute over colonization rights to the planet erupted after the American wormhole opened; they were settled by the Edelman Accords of 2129, which allowed American colonization of a single continent in the northern hemisphere of the third planet. The Americans also named the continent Sequoia. In 2138, China began construction of an antimatter manufacturing station above 11 Leonis Minoris' innermost planet; it is expected to begin production in 2140. Helium-3 and deuterium must be shipped in from mining operations outside the system.